It’s really important when you start publishing a book to spend some time thinking about the idea of success. This is really crucial, for you and for everyone else involved in your publishing project. 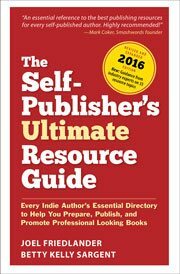 This goes directly to your mindset as a self-publisher, how you approach the whole idea of being a published author. A few years ago I had a friend who had started writing short stories. She didn’t think of herself as a writer. It’s just that there were a number of events in her life, stuff that had happened to her over the years that stood out in her memory. It’s hard to say why one moment sticks out like that, and so many others fade away. But those were the ones she wanted to explore. As these things go, my friend ended up with a book full of stories. She had worked hard, tried to make the stories better, less awkward, more direct. She tried to get to what it was that made them stick in her mind, and she had succeeded more often than not. So she thought it would be nice to make it into a book she could share with the people she loved. I put her in touch with an editor—because every writer needs an editor, don’t they?—and they hit it off right away. It seemed like the editor, with many years of book editing experience, recognized the book inside the book. A few months later my friend presented me with a finished manuscript. The stories now had a gleam and polish like fine gems. Together, it was a delightful book. I created a charming small softcover book for her. It had flaps, nice paper and a pretty picture of a tree from her property on the cover. It was never intended to be sold, it was a way to put her stories into a form that showed them at their best, and which could be shared. My friend became even more adept at using writing. Soon she was giving readings at bookstores and book events near where she lived. People would come, and when they heard her stories and saw the charming little book with the tree on the cover, they wanted a copy. She sold them by hand, one at a time. Soon enough the whole print run was exhausted, and she reprinted the book. Then she sold those, too. By this time she had sold hundreds of copies of the little book. When she realized that people truly loved her stories and the book we had made from them, she decided to expand the book and actually publish it to the world. I hope to have this book to show to you in the future. I love this story because my friend started out with no intention of “publishing.” She had no ISBNs, no marketing, no distribution, no publishing company name, nothing. She did it just for the enjoyment of doing it. Even so, once the book was in print there was just no stopping it from reaching the readers who would appreciate it the most. And my friend now gives workshops, focusing on helping troubled teens through the magic of creative writing. Sometimes the writer writes the book. Sometimes the book has to escape from the writer to live. Often, we can only guess at our own motives for what we do. Standing up, where we can be seen by others in a completely new way, takes a certain kind of courage. For some writers, publishing their first book takes that kind of courage. As a Susie fan, I’m delighted to read about the process of how Growing Down Stories came to be. That collection of real, authentic, and wonderful stories didn’t happen by chance. But it wasn’t forced, either; it unfolded, just as the “marketing” did. It’s inspiring to me, an author who resists marketing but can happily embrace the idea of communicating and sharing. Thanks, Susie and Joel! I put her in touch with an editor—because every writer needs an editor, don’t they?—and they hit it off right away. A question that I don’t think you’ve answered elsewhere (if so, I apologize): do you have any recommendations for freelance copy or development editors who used to work for New York houses? Joel—Thanks for the link! That is, as far as I know. Looking for copy editors is incredibly hard because there’s no way to evaluate beforehand what they actually do. So I’m tempted to do something like hire three different people from different outfits, have each on start in a different place, and see what happens. This has obvious disadvantages—someone who starts on page 100 will have no idea what’s going on—but I’m not sure how else to proceed. One standard way to do this is to select a few pages from your manuscript and give the same pages to each editor you’re considering, and ask them to edit them. This gives you a direct comparison and will let you see the style of each editor’s work. In self-publishing education, there’s generally too much focus on writing book products for target markets to make a profit. There are good reasons to publish that have nothing to do with money. Thanks for pushing that point. I started out designing books for others and got the writing bug myself. After writing and self-publishing 3 novels about a friend’s adventures, I have about 400 pages of my own stories in manuscript form. This one’s for me. I don’t care if I sell a single copy. Five books into my writing “career,” I’m still having fun. What a sweet and moving piece – lovely to see such purity of intent unsullied by commercial considerations. A writer colleague has just followed the same path with her short stories, and I’ll read this at her book launch. I know she’ll be buoyed by the positive example of producing quality work and letting it shine. And it’s nice to take a step back from the relentless pressure of marketing, isn’t it?! What a beautiful story, Joel & Susie! Obviously Susie has a natural talent for writing and the stories resonated with readers. Also ‘marketing’ in person is far more effective than other methods, in my opinion. I also look forward to reading this collection of short stories, as I have a similar collection in mind to write, besides the fact that it sounds like a lovely book. Thanks for your comment Marcia. In my experience with this book, I have to give a lot of credit to the power of the independent bookstore. May they live on! In my town of Portland, Oregon, people fight for independent book stores. At Annie Bloom’s books, for example, the owner wrote in her monthly newsletter: “When I read Susie’s story about what I will likely need when I’m old, I picked up the phone and started reading to my best friend’s answering machine.” Doesn’t get better than that. Wow, Susie! You’re right, nothing better! I’m a defender of indie bookstores as well, as all small businesses. I hope they’ll survive, too. When can we all read your book? Is it available online? It’s not available now. One day, I’ll re-publish it for a larger market. But various excerpts of it are here and there, and if you send me your email address, I’ll give you a few links. I’m trying to figure out what the book looks like now for me; its shape, its core, its heart. When I figure that out, I’ll know how to proceed. But I learned a few lessons the hard way. One big publisher was interested at one point, and by the time their marketing department was finished “packaging” me, I didn’t know who I was anymore. Live and learn. I guess that’s why we are all on this site! What a wonderful offer! I would love the links. My email is marichards320 AT yahoo DOT com. You’re so right, traditional publishers do tend to make changes that authors aren’t always happy about. Follow your path and we’ll all be waiting for your book to ocme around again. Thanks for sharing this story, Joel. Thank you, Susie, for being so gracious. Nice story, Joel, and a refreshing contrast to all the advice we get about promotion and marketing. I’d really like to believe that “if we write it (well), they will read,” but it seems that more is needed to get a book noticed. Thanks, Lynn. Don’t miss the part where the author reached out to her own community, incorporating her book into what she was doing. Marketing is communication, no matter what form it takes. The trick is to find the forms that are both effective and that please you in the doing. Thanks, Joel. We need these little bits of encouragement to validate our efforts and it’s a nice story to read. Keep them coming! Hey, it’s me! It’s nice to read your overview of the birth of Growing Down Stories, because it sounds simple and deeply pleasurable. And it was. Now, I read all the kerfluffle about how I have to market myself and it puts me off. What’s different? Do I need to find “Beginner’s Mind” again? Probably. Anyway, it’s clear to me: the love comes from the writing or forget it. So, Joel, if I ever have book two of Growing Down Stories, you will be the first to know! I remember it exactly that way, and I admired your insistence on keeping it “simple and deeply pleasurable.” And part of the point of the story, to me, is that “marketing” is a very elastic idea that can take many forms. I can’t wait to see your book, so keep my on your list. My journey to publishing a book of short stories has been different, but I can really identify with the comment about courage. Even though I was writing with the intention of publishing, near the end the whole idea of going out there as a first time author started to really worry me. No amount of encouraging comments from friends who had read some of the stories, or my editor, could overcome the gnawing feeling that no one would really want to read the stories. Now the stories are out in the world, and some people have bought the book. Some people seem to like it. Now, I am just building up the courage to write the next thing. Dave, congratulations on getting past the worry, I’m sure all your readers will thank you, and good luck with your next project.